We live in a world dominated by best sellers. A new writer can be forgiven for thinking that the mega-success of writers such as Dan Brown, J. K. Rowling and Stephen King represent to norm. The reality is very different, with debut novelists struggling to even get reviews, never mind selling millions of copies. 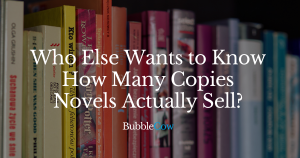 So, how many copies can a novelist really expect to sell? The problem is that this is an almost impossible question to answer. It is commonly quoted that the vast majority of books published each year will sell less than 1000 copies. Yet, even this magic 1000 per year is a misleading figure. Many of the books that sell sub-1000 come and go with no marketing, no budget and, to be honest, no expectation. I feel like the writing is my job. Once done, I participate in the marketing with my publisher, do readings, etc., but how it is received is not my job. I try to avoid the status reviews and just write the next one. Good idea. I plan to use a real publisher for my next novel. Hopefully things will go better.